CARE for Children partners with wheelchair and adaptive equipment vendors to hold the Verner W. Smith Wheelchair and Adaptive Equipment Clinic for children in need of custom equipment for medically based needs. The free clinics are a community service to provide expert evaluation to assess needs for seating, positioning, and mobility. The clinic includes assessment of the current equipment being used, as well as the functional status, social history and seating/mobility needs of the patient. Correct seating can maximize the functional independence, mobility, posture and breathing of each patient and serve to protect skin integrity. Vendors work with certified suppliers and insurance companies to meet the individual needs of each child. Many vendors specialize in custom wheelchairs and medical equipment for people who are profoundly involved. Individual consultations can be made on a case by case basis throughout the year. The annual clinic was renamed in memory of Verner W. Smith of Bradford who passed away in June 2008. Smith was a long time supporter of CARE for Children as well as a recipient of services from the agency as a child. For more information about the Verner W. Smith Adaptive Equipment Clinic please contact CARE for Children. CARE for Children loans walkers, wheelchairs, crutches, canes and adaptive recreation equipment (hockey sleds, ice gliders, adaptive bikes, golf clubs), with the referral of a CARE therapist or other health care provider. CARE also has access to larger adaptive and medical equipment loan closets and will try to locate equipment for pediatric patients. 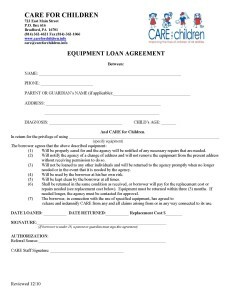 Equipment is subject to availability and fit, the loan program is free of charge. CARE also accepts the donation of gently used adaptive and medical equipment. 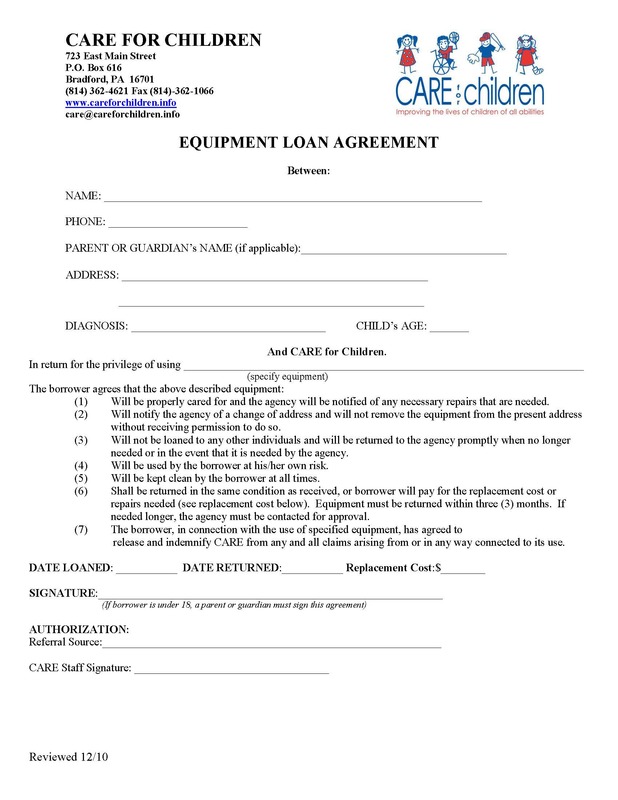 Please contact CARE for Children at 362-4621 for more information about the Pediatric Equipment Loan program.